Chicken in a rich lemon butter sauce? 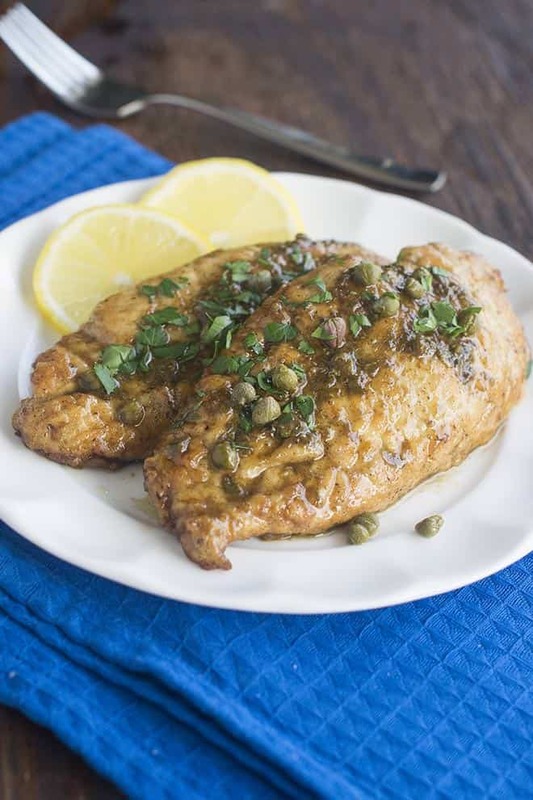 That’s right…it’s Chicken Piccata time. Who’s in? Over on The Cookful, my sister site, we just did a big series on Chicken Parmesan. Here’s our classic chicken parm recipe and you can see all the chicken parmesan variations here. So much chicken parmesan! Mmmm. All those chicken parm recipes made me think of other dishes that are also based on scallopine (flattened out chicken or other meat). When Chicken Piccata came to mind I just had to pounce and make some. Immediately. It’s so good. What is Chicken Piccata, you ask? In Italy, piccata dishes are made from veal or swordfish usually. In North America we tend to use chicken. We’re a tad chicken-obsessed over here. Piccatas can vary in several ways but the main important things are lemon and butter. It should be really tart and lemony and rich all at once. 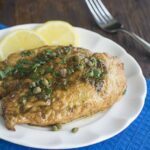 To make this chicken piccata recipe you pound some chicken breasts flat and then dredge them in seasoned flour before sauteing them until browned. Those get set aside for a minute while you pour lemon juice and chicken stock into the pan. And a good handful of drained capers. If you’ve never had capers before, this is a good time to try them. I find them to have the pickled, salty flavor of dill pickles or olives. However, even people I know who don’t like olives often like capers. Give them a taste. They add a great briny flavor to all kinds of dishes. So, the lemon juice, chicken stock and capers are in the pan. Stir them up, scrape the bottom of the pan a bit if there are any stuck bits from the chicken. Bring it to a boil. Then you add the chicken back to the pan and let it cook through. Take the chicken out of the pan and put it in a single layer on a clean serving plate (as in, don’t use the plate that had raw or half-cooked chicken on it). The final touch is to take the sauce off of the heat and whisk in some butter. This is going to thicken the sauce a bit. Pour it over the chicken. Time to eat! Pound chicken breasts to an even 1/4 inch thickness (photo tutorial for how to do this is here, steps #1-2.). Cut each one in half to make 4 portions. In a medium bowl mix together the flour, garlic powder, black pepper and salt. Dredge chicken in flour mixture so that it is dusted in white. Shake off excess. Heat the olive oil and 2 tablespoons of the butter in a large skillet over medium-high heat. When hot, add chicken. You may need to cook the chicken just 2 at a time. If so, add more olive oil and butter before cooking the second batch. Cook chicken until brown on both sides, about 2-3 minutes per side. Transfer to a plate lined with kitchen towel. To the pan add the lemon juice, chicken stock and capers. Scrape bottom of pan and then bring to a boil. Return chicken to the pan (it's fine if pieces overlap a bit at this point so add all 4 pieces even if it's a tight squeeze). Cook until chicken is hot and no longer pink inside, about 5 minutes. Remove chicken to a large clean serving plate (as in, don't use the plate that had raw or half-cooked chicken on it). Arrange in a single layer. Remove pan from heat. Add the remaining 2 tablespoons of butter to the pan and whisk it vigorously. Taste. Season with salt and pepper to taste. Pour over chicken. Garnish with parsley and lemon slices, if desired. I really don’t know. When I search for it I find people claiming that it’s a classic Italian dish and others claiming that it’s Italian-American. A few sources say that the sauce is Italian but not usually used on chicken (seafood or veal instead). Seems complicated. Piiiiiiittman…..this one is so awesome! But I have never heard the word piccata in Italy, maybe it’s just me.